Arrrhhh… I Feel a Change in the Wind, Says I….. In what could be an ominous sign for Barack Obama just days before he is formally named the Democratic presidential nominee, a new CNN poll of polls out Tuesday shows the Illinois senator’s lead over John McCain has been cut in half in recent days. Heading into the candidates’ appearances on Saturday night at Saddleback Church, the conventional wisdom in politics was Barack Obama should have a clear upper hand in any joint appearance with John McCain â€” one the young, eloquent, cool, charismatic dude who can charm birds from the trees, the other the meandering, sometimes bumbling, old fellow who can barely distinguish Sunnis from Shiias. Well, kiss that myth goodbye. McCain came roaring out of the gate from the first question and was a commanding figure throughout the night as he spoke directly and often movingly about his past and the country’s future. By contrast, Obama was often searching for words and while far more thoughtful, was also less emotionally connective with his audience. A web site that averages all significant polls, RealClearPolitics.com, has previously projected that just looking at polls, Obama was ahead in states with over 300 electoral votes; now he is down to 275 â€” a tiny cushion since 270 is the magical number for winning. At Saddleback, Obama surely held on to his base support but McCain strengthened his and probably appealed to some undecideds, too. In short, the tide is moving for the first time in the Republican direction. And the realization is setting in that McCain might just win. PRINCETON, NJ — Barack Obama has 45% of the support of registered voters and John McCain 44% in Gallup Poll Daily tracking for Aug. 16-18, as vice presidential announcements and the two conventions loom in the near future. Barack Obama’s public image has eroded this summer amid a daily onslaught of attacks from Republican rival John McCain, leaving the race for the White House statistically tied, according to a Los Angeles Times/Bloomberg poll released today. Far more voters say McCain has the right experience to be president, the poll found. More than a third have questions about Obama’s patriotism. American likely voters say 55 – 27 percent that Arizona Sen. John McCain is better qualified than Illinois Sen. Barack Obama to deal with Russia and now trails the Democrat 47 – 42 percent, according to a Quinnipiac University national poll released today. This compares to a 50 – 41 percent Sen. Obama lead in a July 15 poll by the independent Quinnipiac (KWIN-uh-pe-ack) University. Kerry at least lost his race in August, after the convention, whereas Obama lost this race in June and July, because he had a Sally Field-esque “You like me” moment over and over again. He believed the hype from his own Stepford cult about a new kind of politics, assumed he didn’t need to define his opponent because it was beneath him, and gutted the ability of the Democratic Party and its infrastructure to hold McCain accountable. And them he took a victory lap tour overseas to get photo ops while McCain began to define him here at home, by trying out attack lines until some of them got traction. And then in typical GOP fashion, McCain found the ones that worked, hammered them over and over again, and turned Obama into a boring and iffy choice against a guy who should be ten points behind by now. I’d say buyer’s remorse has set in bigtime, as I”ve suggested repeatedly for months now, it would. With so many instances of corruption and influence-peddling around him and whatever problems with the candidate that are keeping the campaign from letting reporters interview him anymore, John McCain is now again charging Obama with what amounts to soft treason — wanting to lose the war in Iraq in order to make himself president. The lack of any consistent lines of attack against McCain is becoming palpable. Well, look, Josh… maybe there’s nothing there Obama can really attack, huh? I’ll bet they’re hoping for a really big bounce from the convention. Only one problem; The convention will be a bloody mess form the word go… what with left-wing protests outside and division between Obamanaiacs and Clinonistas inside, this is going to be a real show, though I doubt it’s one the Democrats want to show the country. It will, in effect, re-raise all the negatives that Obama’s been fighting all along, and half of it will be Obama’s doing as he tries to unravel this mess. Democrats know that the rockstar act in Berlin hurt Obama badly here at home, though apparently Camp Obama hasn’t figured it out yet. So, they’re still looking forward to playing the same act at Denver’s new sports stadium next week. Lemmings, you see, like to travel in packs. And let’s be honest, here. At no point in this long sordid mess has Obama EVER really had a solid lead. Press orgs poll left anyway, as has been demonstrated over and over. Democrats leading by the margin of error or less in June will turn up losing in November. Let’s go further, here. The Domocrats have been crowing about their own internal numbers suggesting they were going to extend their leads in both houses of Congress? Fat chance. Coat Tails work negatively, too, as we’re about to see over the next few months. The downright racist and anti-American campaign Obama’s been running has been successful only at hurting the Democrat party’s congressional hopes. And the interesting thing about this, is the Democrats I see are saying this, as well as the experts I’ve quoted. Poke around at Memeorandum among the blogs, such as TalkLeft, the Kossacks and the DU. They’re scared to death, folks. After all the self-assured hutzpah we’ve been dealing with for the last 6 months, it is perhaps the most ominous sign of all for Obama. His loudest supporters have started to figure out they’re in more than serious trouble. The really amazing part of this is, and I’ve seen Democrat after Democrat agree with me on this… all this is not because McCain is a strong canddiate. He’s not, and we’ve said this time and again from these spaces. It’s just that Obama is such an incredibly WEAK candidate. Picture this one, as one would two guy’s trying to outrun the lion. You don’t have to be outstandingly fast… just faster than the other guy. 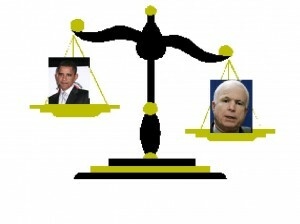 It’s becoming quite clear McCain, for all his faults, is proving to be the stronger.